Cap 4-12 cm broad, convex, becoming nearly plane in age, sometimes slightly depressed at the disc; margin incurved, then decurved, at times upturned at maturity; surface dry, finely pubescent, in dry weather areolate, the underlying flesh pallid to buff, rarely pink; cap color variable, ochraceous-brown to medium-brown, less commonly reddish-brown; flesh pallid to pale yellow, firm, thick, unchanging or bluing weakly when cut; odor and taste mild. Pores bright yellow becoming ochraceous in age, angular, relatively large at maturity, 1-1.5 mm in the longest dimension, sometimes discoloring brown from handling, bruising blue inconsistently; tubes dingy yellow, up to 2 cm long, depressed at the stipe or subdecurrent, the tubes descending the stipe a short distance as ridges or forming a sparse reticulum. Stipe 4-8 cm long, 1-2 cm wide, solid, equal to tapering to a narrowed base; surface yellow at the apex, often longitudinally ridged or somewhat reticulate, pale yellow to pallid below, nearly glabrous or with appressed fibrils, discoloring brownish in age or from handling, yellowish mycelium with adhering debris at the base. Spores 10-15 x 4-5 µm, smooth, thin-walled, elliptical to subfusiform; spore print olive-brown. 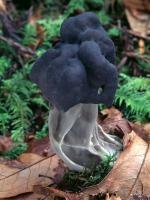 Solitary to scattered in mixed hardwood/conifer woods; fruiting from late fall to mid-winter. Edible, but of little culinary value. 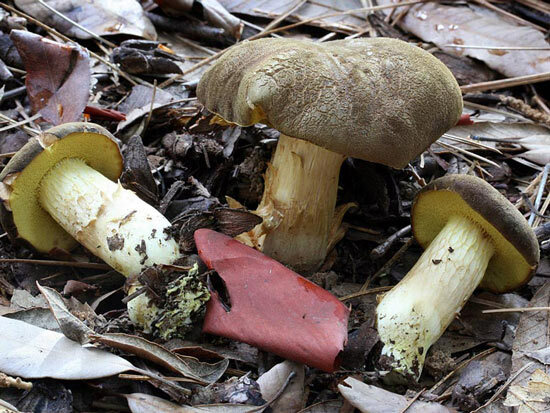 Boletus subtomentosus is characterized by an ochraceous-brown to brown, finely pubescent, occasionally areolate cap, yellowish pores that bruise inconsistently blue, and a relatively slender, almost "leggy" stipe. Boletus spadiceus var. spadiceus is very similar and is best distinguished with the use of NH4OH which stains the cap momentarily blue. Other Boletus species in our area which could be confused with B. subtomentosus include Boletus zelleri which has a darker, velvety (when young) cap and reddish stipe; Boletus chysenteron, which has a brownish, areolate cap with pinkish cracks and a less conspicuously rufescent stipe; and Boletus truncatus, similar to B. chrysenteron, but with pores which bruise blue instantly, and spores that are blunt or clipped at one end.